Egypt's Coptic Christian minority has become a favorite target for Muslim Brotherhood supporters and other radical Islamists across the country in the wake of the military's decision to clear supporters of ousted President Mohamed Morsi from their Cairo sit-ins this morning. No sooner did security forces, backed by armored cars and bulldozers, clear encampments in the city's Nadha and Raba'a al Adiwiya squares did the Islamists turn to targeting Christian churches. 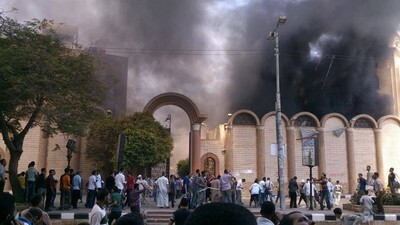 Approximately 1,000 Muslim Brotherhood supporters set fire to the Churches of Abraham and the Virgin Mary in Menya. Angry mobs also targeted churches, monasteries and other church properties in Alexandria, Suez and a number of other cities in Upper Egypt, according to Egypt's Al-Ahram. "It is a climate of violence," he added, "and the people are scared," Father Rafic Greiche, a Catholic Church spokesman in Egypt, told Vatican Radio. Sixteen Coptic churches had been torched by pro-Morsi mobs, including several ancient ones, the Egyptian blogger "Big Pharoah" wrote in a Twitter post. Brotherhood supporters blame the Copts for toppling former Egyptian President Mohamed Morsi because Coptic Pope Tawadros II backed the military's July 3 move to oust him. "These guys have been blowing places up and killing people in Sinai. They've been attacking churches all over Egypt – putting al-Qaida flags and Morsi's pictures on churches, so there is no question that the Brotherhood are the new terrorists," Michael Meunier, president of Egypt's Al-Haya Party and a Coptic Christian, said regarding the violent Islamist attacks against Christians since Morsi's fall. Just last week, a 10-year-old Coptic girl was shot dead by Islamic militants on her way home from Bible school. Muslim extremists tossed firebombs through the windows of four Christian homes and a local church last Sunday to stop a Christian neighbor from building a speed bump in front of her home. The clash left 15 people wounded. But if you ask some Muslim Brotherhood leaders about Christian-Muslim relations, things have never been better. Muslim Brotherhood politician Abdul Mawgoud Dardery, who served in Egypt's dissolved parliament as a member of the Freedom and Justice Party, denied during a press conference last Friday held at the National Press Club in Washington, D.C., that the Muslim Brotherhood was anti-Christian. Dardery was asked about the torture and violence that had been visited on the Copts by Brotherhood supporters during Morsi's year in power, but Dardery deflected the question. "[W]e've had the best relationship for the past 1,400 years," he said. "Compare the relationship in Egypt between Muslims and Christians and many other countries in the world, you will find Egyptian model is one of the best models on the face of the earth." Egypt's military moved on Islamist protesters Wednesday and dozens of people died in the fighting. It's a tragedy for all involved. But the Islamists' reaction – to attack a Christian minority that might comprise 10 percent of the country's population – is an outrage that exposes the depravity of their thinking. Scapegoating, conspiracy theories and attacks on innocent bystanders. They all show the hollowness of Dardery's platitudes and what the Brotherhood really believes about Egypt's Coptic Christians. The Muslim Brotherhood and the Salafists are slaughtering Coptic Christians, torturing them, kidnapping them, burning down their homes, their churches and their monasteries. The USA continues to quietly support the Muslim Brotherhood and the Salafists. When will the Christians in the USA wake up and stand with the Coptic Christians of Egypt? Will Catholics, Baptists, Methodists, Lutherans and others step up and demand the US. government stop supporting the Muslim Brotherhood and al-Qaeda? Will they demand that their American government come to the defence of the Christians of Egypt which include Coptic Orthodox, Greek Orthodox, Catholic, and Anglican Christians? Or is the Christian Church in the USA just a navel gazing money making venture yoked to the export of U.S. foreign policy? Today's destruction of Christian Churches and Muslim Brotherhood's liquidation of innocent Christian children in Egypt is the modern Islamic pattern for all those who've ever wondered why the ancient and peaceful CHRISTIAN NATIONS of Iraq, Kuwait, Turkey, Jordan, Syria, Egypt, Tunisia, Libya, etc. have become Islamic hellholes today. It's called: "Erase the Kafirs" from the world. Welcome to the Peaceful Religion of Islam. Christianity was 600-years-old in these wonderfully peaceful countries, until Islam's prophet called for a brutal way to create Islamic hegemony worldwide.